In so many places right polity takes precedence over the gospel. Violation of polity may be our modern form of heresy. In my off day reading, I enjoy reading different theological works, biographies, practical ministry helps, and a variety of other material. But I am always drawn to theology, and in particular, theology in practice. When I came across this thought I was struck at both its truth and the inherent danger of which us are at risk. First, the statement is true. I personally have experienced it in churches. The way a church functions, the way things have always been done, seem to be an unbreachable barrier to growth and change. We are creatures of habit, to be sure. But we must not allow the comforts of our habits to prevent us from changing and growing. And certainly we should not change simply for change’s sake. Our changes must be one of calculated research, drawing from Scripture and tradition to make positive changes in the lives of our churches. Secondly, we must always be careful to watch our own lives for this danger. In working with other churches and denominations (which is Scripturally good and commanded) we run the risk of avoiding certain people, groups, or even whole denominations simply for the fact that they do church a little differently than us. In our efforts to see the Kingdom of God continue to grow in our lives and communities, let us not let polity (or whatever else may come in the way) take precedence over the gospel. One way in which we can help in our discipleship is to ask questions. Jesus loved asking people questions. It is a great way to engage in conversations that are natural and reveal the actual thoughts and feelings of an individual. The simple question, “How is God present?” is a great way to help students begin to look for and acknowledge him in their everyday lives. Mark Yaconelli, in his book Contemplative Youth Ministry, gives four reasons why this is so helpful. This gives the students the reminder that God is actually with us (as the name Emmanuel is defined) and that He is intimately interested in our lives. Whether it is a soccer match, volunteering at the rescue mission, or simply taking a walk down the street, God is with us. What an incredible thought! Your student has the capacity to notice God. This is the Creator we are talking about. The one that said, ‘Let there be light’ and there was light. Sometimes adults can give off the impression that students cannot understand God and the awesome privilege we have to relate to Him. By asking that simple question we affirm our belief that they have the ability to see God at work in their lives. And what better goal as those to whom God has gifted us with the training and rearing of these wonderful students, than to help them ‘develop their sensitivity to God’? This is, and should be, our heart beat, to draw the hearts of our students to a deep love of our Father. I am praying for you, as you have the most influence, the most time, and the most potential, that God would open your eyes to the many opportunities we have to point our students to ‘the Name’, as the Jewish people call Him. I’ll admit, the title is lengthy. Fourteen words that could probably be summed up in three may be overkill, but it reminds me of older works written in the 18th century. However, it summarizes the main idea behind this post. The need for ‘definite and exact knowledge’ when studying, reading, and teaching the Scriptures should be evident in the most basic sense. Unfortunately, a brief look into blogs, a short ‘sermon’, or even a glance through many commentaries will yield ample proof that this truth is not so basic. Scripture is clear that study is necessary for both one’s personal growth as well as the mutual encouragement of others (Joshua 1.8, 2 Timothy 2.15 and 3.14-17 to name a few). Why would Holmes have this passion, as Stamford puts it, for ‘definite and exact knowledge’? For Holmes, it dealt with legal matters, with justice. These are, no doubt, of the utmost importance. The proper punishment for the guilty individual is vital. In the affairs of men there is not a higher calling. But students of Scripture are not to live in the affairs of men alone. Our minds are to be on heavenly things (Colossians 3.1) and as such should be filled with heavenly thoughts (or Scripture, if you will). As such we should have a passion, an all-consuming goal for ‘definite and exact knowledge’, and that of Jesus of Nazareth. He is the One Whom we teach. It is Him that we point to in our studies, in our messages, in our small groups, in our shopping trips, in our school assignments, in our friendships, in a word, our life. Our description from Stamford seems to have an equivalent thought in the Tanakh, in the book of Nehemiah. Do you see the connection? The Levites had a passion for definite and exact knowledge of God’s Law and sought to pass that on to His people. May this be our goal, our prayer, each time we study and present God’s truth. My wife purchased several books for me for Christmas. I love books! No matter what the occasion, if one were to ask me, “What can I get you?” My reply is always, “Books!” But I also like specific books. I thoroughly enjoy theological books, church history, but also practical books. 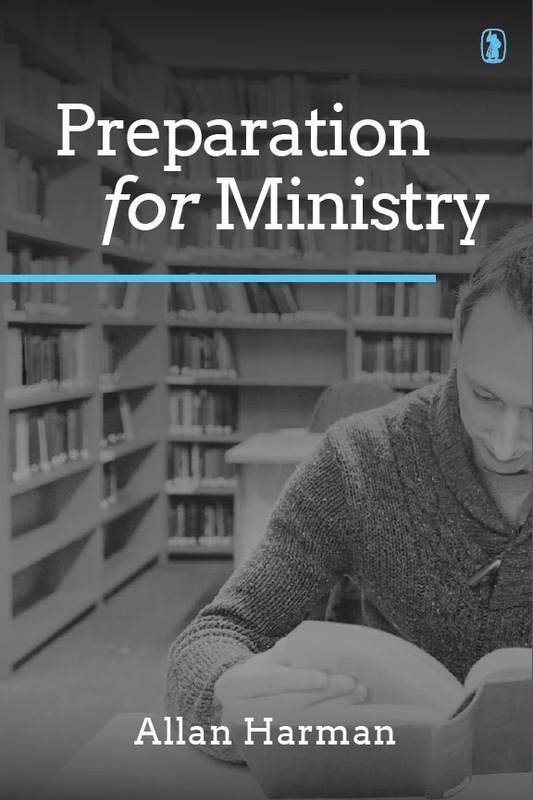 I received several books on youth ministry and communication, but along with these practical works Hannah gave me the book titled, “Preparation for Ministry”. It is written by Allan Harman, a pastor and professor. My first thoughts regarding the work is that it would be more substantial. The actual work only covers 43 pages, but to my surprise the conciseness turned out to be a strength. More on that to come. My second thought is that, because it is written from a Reformed tradition, that it would be incredibly strict concerning its applicational thoughts to ministry. Again, the book greatly surprised me. The third thought I had when perusing the table of contents was that more than half the book was focused on sermon preparation and an address by B B Warfield. While I am still sightly disappointed with the length, the benefits of the appendixes are worth purchasing the book. As I promised, the conciseness of the book turned out to be a great strength. As a minister (praise God! ), a seminary graduate, and a lover of knowledge, I tend to enjoy rich and challenging theological works. If a book has a bibliography of 15-20 pages, then I get excited! So when I received the book and saw the size of it, I was disappointed. However, upon reading the work I was pleasantly shocked that the length did not impugn upon the content. Rather, it fortified it. Granted, this is not (nor does it claim to be) a work of thorough scholarship. It is a book concerned with “a call to ministry, theological training, and entry into pastoral work.” (vii) The length makes it an excellent tool to pass on to young people dealing with the question of a call to ministry. Additionally, it makes for a great tool for small groups to discuss, especially in the presence of a current minister. Another strength that comes from this work is that is weds intellectual study with spiritual vitality. The address by Warfield entitled, “The Religious Life of Theological Students” wonderfully incorporates both the need for personal piety and the blessings and necessity of communal life. I have heard from individuals that books are not needed, we simply need the Bible. And while I do not mean to undermine the Scriptures, this is foolish thinking. Warfield’s comments are amazing: “Sometimes we hear it said that ten minutes on your knees will give you a truer, deeper, more operative knowledge of God than ten hours over your books. ‘What!’, is the appropriate response, ‘than ten hours over your books, on your knees?’ Why should you turn from God when you turn to your books, or feel that you must turn from your books in order to turn to God?” (95) Harman does a great job of wedding the two as well in chapter five. And one final strength, which is also personal for me, is the emphasis Harman places on the minister’s family. In his chapter “Staying Fresh” Harman writes, “Your first priority has to be your own family, who need fatherly care and attention. Nothing can substitute for this, for if you cannot care for your family, how can you care for the church of God? (I Tim. 3:5)” (38) I know of several ministers who have ruined their families and ministries because they neglected their families. For him to include this in a work designed for young people, it is priceless advice. I have to conlude, predominantly because I don’t want to rewrite the book, but also because it would be worth your time and money to purchase and read it yourself. I would like to, however, address one of my comments regarding the predominat Reformed overtones of the work. A brief glance at his references and it is easily seem that his Reformed background comes into play. But the surprise was that the work itself would avail to backgrounds of several persuasions, and since it is a work for the Church (notice the capital ‘c’), it can and should be applied to all within Christ’s body. So, preacher friends, get this book! Keep a couple of extra copies for those young people who may have a spark of God’s call in their lives. Church member, check it out! This book gives a brief glimpse into the life of your minister. It will enable you to pray for fervently and effectually for him, and speaking on behalf of ministers, we need your prayers.